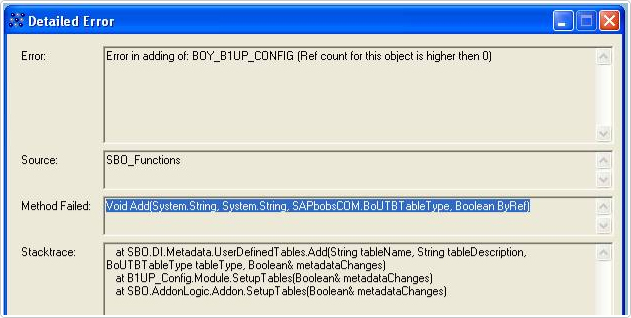 SAP Issue - "Error adding <table/field> (Ref count for this object is higher then 0)"
This error can happen in rare situations during extreme workloads. It can only happen when new metadata are being created (first time installation or activation of and previously inactivated module). Restart the add-on and the problem should disappear (on very slow machines this error can happen 3-4 times in a row)… Keep restarting until the all metadata is created. In some cases, other add-ons running at the same time can be the cause of this so if restart does not help, then stop all other addons, start our add-on and let it create its data. Once complete you can run the other add-ons as before.